This month I go about as far-a-field as I ever have. For a few years now I have been finding creative ways to use the dust from meteorites that accumulates in the bottom of the saws and lap. Thus far I have made inks, paints, glazes for ceramic pieces and fired it onto glass. This month I take you on my journey of making magnetic meteorite paper. During my years as the owner of a printing company and the plant manager of several others I saw every kind of paper there was. I have shot printing negatives and color separations for gallery catalogues of fine art pieces. Many of the art pieces done on special papers like rice paper or thick stone lithography paper. I’ve done embossing, gold foiling, even hand calligraphy on handmade papers that customer supplied. Printed reproductions of water colors, pastel drawings or charcoal drawings each on papers to mimic those used in the originals. 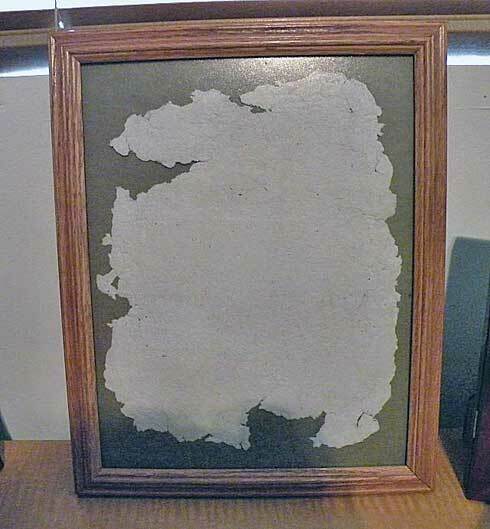 In the back of my mind I always wanted to try my hand at making some paper myself. I knew how to do it. I even thought I had saved some old silkscreen frames to make paper making molds out of. On a Friday afternoon I hunted for those frames and could not find them. I grabbed an old picture frame instead and stapled some fiberglass window screen to it. I went in the house and asked my wife if we had an old blender we could give up to the papermaking project. I found one under the cupboard. I sat down at the crosscut shedder in my office and mulched up about three pounds of old mail, waste paper, and about anything else made of cardboard or paper that I could find. With a box full of material to recycle I headed back to the garage. I put the crosscut bits into the blender in small batches with a lot of water and turned it back into pulp with about 30 seconds of blending. Now the fun began. 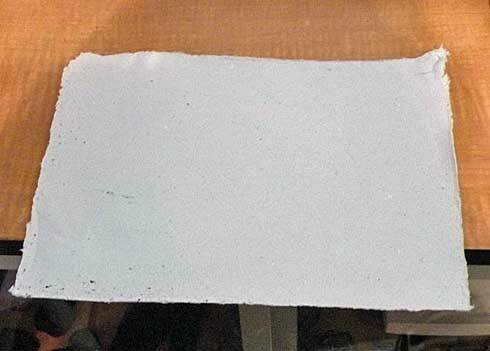 Paper whether handmade or made in a huge paper mill begins its life as 95% or more water. The challenge for me was how to handle the goo after I got a layer of it in the mold frame. My first sheet was too thick a little lumpy and I had a difficult time transferring it from the mold to another flat surface. But, I saved the sheet and framed it since I am pretty proud of having finally gotten around to trying this after forty years. My second sheet was a small experiment in mixing some meteorite powder into pulp. 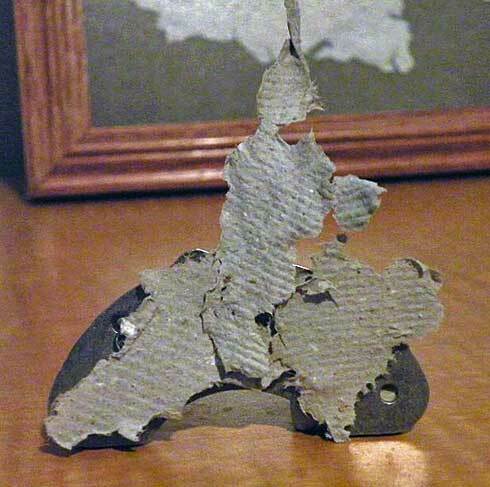 The sheet was a disaster from the point of view of removing it intact from the mold. I did everything wrong and yet I preserved a batch of small pieces to see if they would in fact be magnetic when they dried. Well they were and that was fun. You can see them sticking here to a magnet. Now the third sheet that was a different story. By the time I did it I had cut the right size fabric to transfer the wet sheet to and had found an old drywall sponge to absorb gently a lot more of the water than the previous sponge would. Sheet number three came out almost complete. It was uniform in thickness, and just the thickness I wanted. 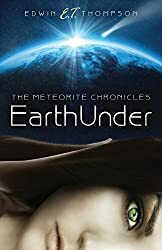 It was made from a full batch of pulp with nickel iron particles collected from my meteorite dust. So I was sure it would be magnet responsive paper. Well the wait was on. Home paper making is one of those things that requires patience. Even after you have sponged and squeezed out as much water as you can, you still have a long wait for the paper to dry. But, the next day I would know what I had made. What will I do with the paper? I am not sure yet. I saved a small letterpress from my past. And I have some inks and some vehicle. So I may make some unique cards or certificates of authenticity or specimen tags like the one below. 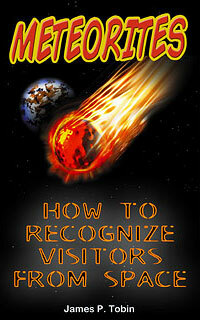 Or something special for the occasional meteorite I give away. Will probably use inks with meteorite pigments somehow in the printing. They won’t be real colorful with just meteorite ink. You can get a lot of browns but that is about all. There was a time not that long ago that all paints and inks were made from natural ingredients. Many times it was powdered minerals. Today some can still be used but many have been found to be toxic. Nickel is a toxic material so there is a limit to the uses of meteorite pigments. 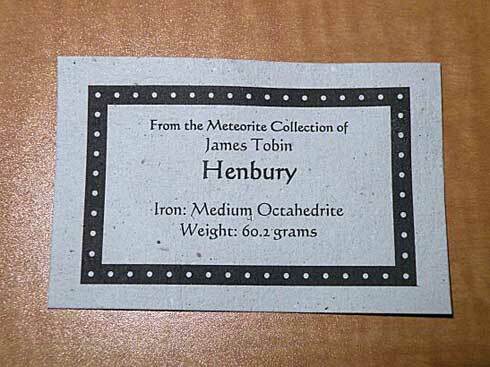 But, I think I will find a nice variety of uses for my meteorite paper. This like many other little inventive projects I have done was a hoot and something I will long remember. Who knows, maybe I will find papermaking another way to make a few bucks in my retirement years. (if those years ever come) There are actually a lot of handmade paper websites where people are selling their creations. But, none so far selling any with meteorite in it.